Families and educators can work together to ensure children have successful literacy experiences in and out of school. This is especially important if children have reading difficulties. Children with reading difficulties have specific instructional needs that are best addressed with a comprehensive approach to literacy development that includes supports at school and home. Families and educators play important roles in a comprehensive approach to reading through four key actions: Learn, Advocate, Partner, and Support. Learn:Understand the parts of literacy, how children learn to read, and why they might struggle. Children struggle to read or write for many reasons. They may have trouble breaking words into sounds, understanding what they read, or with language. Children can also struggle because instruction might not be matched to their needs. Understanding how children learn to read can help you recognize a child’s reading and writing problems. If you have concerns about a child’s progress, share them with each other. For example, a vision or hearing issue may be interfering with a child’s ability to read and may need to be brought to the attention of the child’s doctor. Being informed can help everyone make better decisions about a child’s education. Advocate: Promote evidence-based literacy approaches in schools and early childhood settings. Learn ways to advocate for a child’s education. Families, educators, and community members should work together. For example, interact regularly to talk about your common experiences, share resources, and learn together. Joining with others can help schools review and improve supports for all children. Support the use of evidence-based reading programs and instruction, additional instruction for struggling readers, and data to make decisions about children’s instruction. Partner: Work together within a system of support. Positive home-school relationships are important for literacy development. Address concerns about a child’s literacy skills and academic progress together. Schools should provide families with activities and tools that a child could use at home. Schools should also provide opportunities for families to stay involved. Talk with each other about the instruction or intervention a child receives at school. Being involved will help catch reading difficulties earlier. It will also help a child be more successful in school. Support: Provide literacy opportunities and reinforce skills taught in early childhood settings or school. Practice at home the skills learned at school. Children with reading difficulties benefit most from practicing skills. Schools should offer families information about what to practice. At home, everyday activities are a great way to boost literacy development. Talk with children, ask questions, and listen closely to answers. Read together, say the alphabet, play with sounds, and match letters with sounds. Explore your community and talk about it to help children learn about the world around them. Lin, Q. (2003). Parent involvement and early literacy. Family Involvement Research Digests, Boston: MA: Harvard Family Research Project. Sénéchal, M., & Young, L. (2008). The effect of family literacy interventions on children’s acquisition of reading from kindergarten to grade 3: A meta-analytic review. Review of Educational Research, 78, 880-907. Toso, B.W. (Ed.). (2013). Research Strand Conference Proceedings from the 22nd National Conference on Family Literacy ’13: University Park, PA: Goodling Institute for Research in Family Literacy, Pennsylvania State University. U.S. Department of Health and Human Services, U.S. Department of Education. (2016, May 5th). Policy statement on family engagement from the early years to the early grades. Washington, DC: Author. Families and educators can work together to ensure children have successful literacy experiences in and out of school. This is especially important if children have reading difficulties. 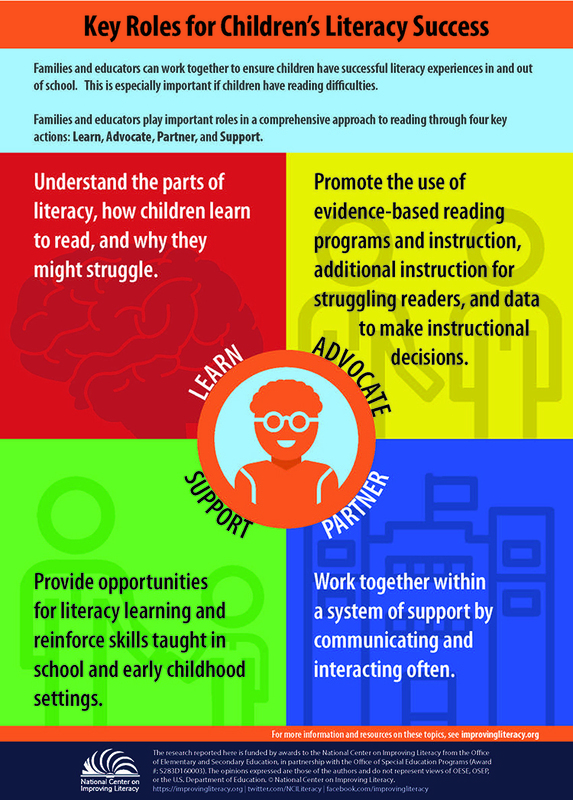 Families and educators play important roles in a comprehensive approach to literacy development through four key actions: Learn, Advocate, Partner, and Support. This 50-minute webinar overviews the five big ideas of reading, discusses tips for supporting your child's literacy development at home, and explains how schools assess and monitor your child's progress. This booklet describes activities that parents can do with their children to improve reading skills at specific ages from kindergarten through third grade. This resource has questions that families can ask a teacher during a conference to gather information about their child's literacy development.